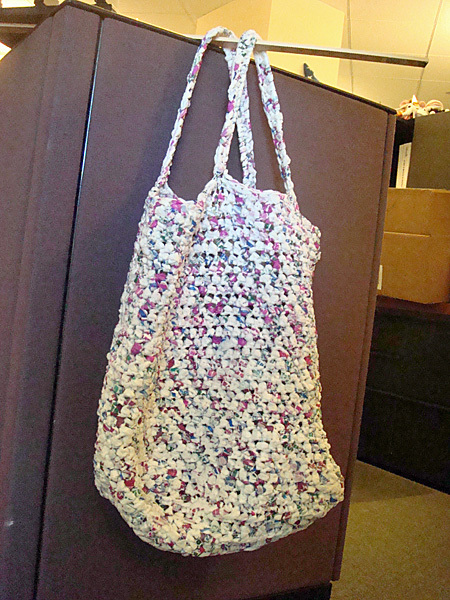 A crocheted plarn tote bag with a flat bottom, modeled after a brown paper grocery sack, provides a lot of room for groceries or other bulky loads. 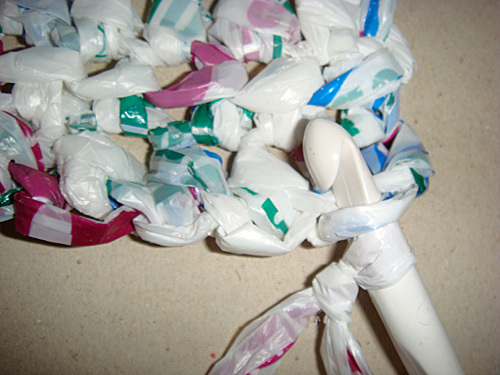 The bag body is formed by joining plarn directly to bottom. Note: measurements are not exact because of the pliability of the plarn. Hold the corners of one side of the bag bottom to estimate the center of the side and therefore where to insert the hook at the top of the bag. Tip: use excess plarn to reinforce handles with a whip stitch, then weave in ends. 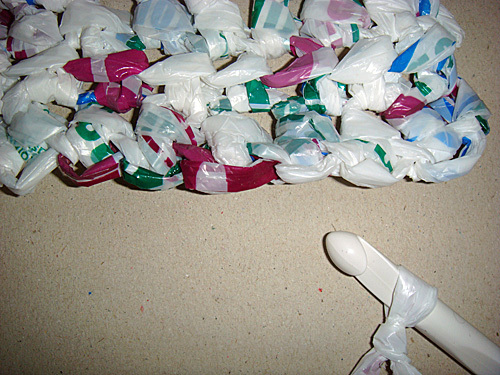 A large paper clip or safety pin makes a great “needle” to weave in ends. I love this idea and would love to do it but I only know how to knit. Do you have the knitting equivalent instructions? PBC Admin: We are sorry but at this time we can only offer crochet instructions. If possible we will try to find a way to translate them. Love this, it not only looks gorgeous, but it practical too! Could you please tell me how to lay out and cut the plastic into fabric strips? What size? Can they be folded in such a way as to get a longer piece of plarn? could you braid the plarn to make braided rugs, etc (looking for ideas for those of us with hand problems that prevent crochet) thx!!! PBC Admin: We don’t see any reason plarn could not be used in patterns where rag strips or bulky yarn is called for. Of course, the final product dimensions will vary. I was also wondering about how to cut the bags. I thought maybe cut strips around like an old=fashioned apple peeler to get one long strip, or maybe cut strips across to get lots of circles,then loop the circles together with a slip knot. 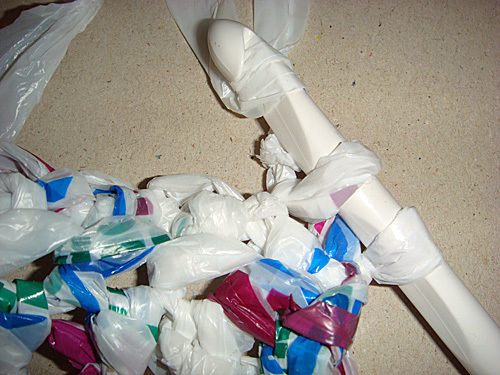 Your plastic yarn would bulky, but twice as strong. Can’t wait to try Plarn for my out door Christmas ornaments. I would suppose. 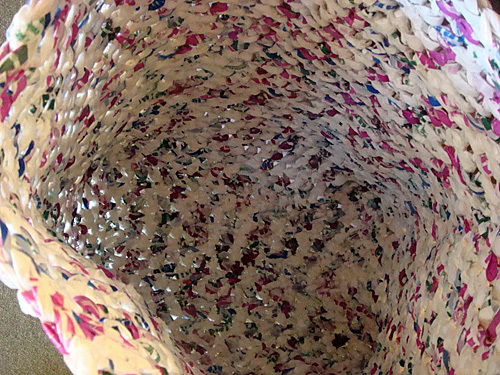 the wet plastic, over time, would eventually rot. I love this bag and like the ohter lady I only know how to knit . And I would love to have this in a knit instructions . Please ! I have made lots of these bags. They are realy great for shopping. 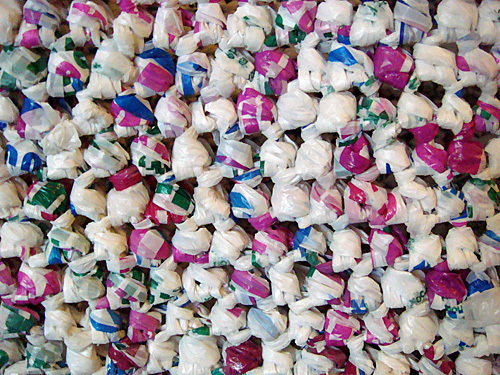 I wonder if the bags could be cut into a continuous strip similar to the way t-shirt yarn is done?